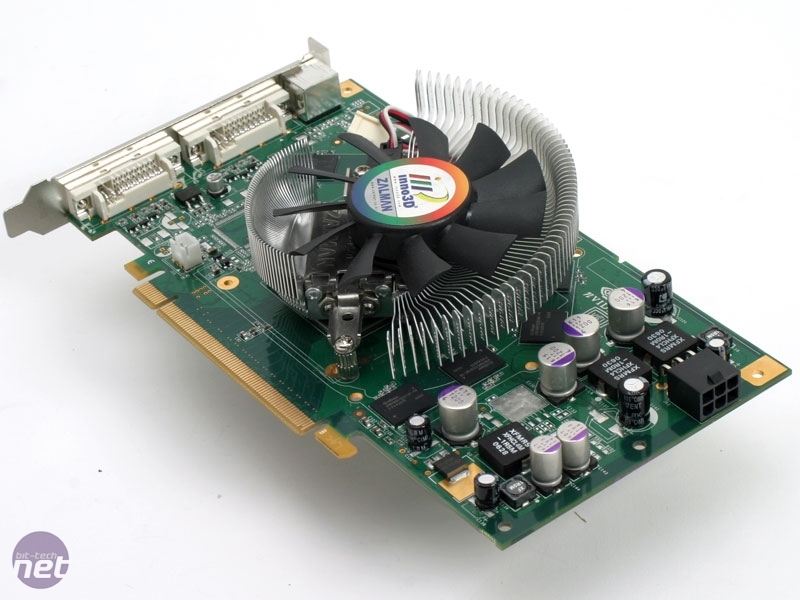 We haven’t looked at many Inno3D video cards in the past - in fact, the first one we looked at was its GeForce 7900 GS. We found that card to be pretty good, and we especially liked the Zalman heatsink/fan combination - it impressed us enough to take a look at more of their products. 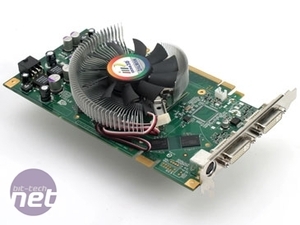 Fast forward to today, and we have the company’s GeForce 7950 GT implementation in house for a thorough once-over. 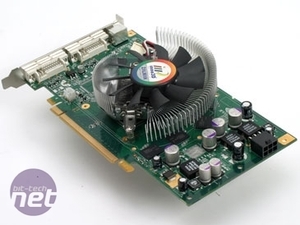 Earlier in the month we had a look at XFX’s impressive GeForce 7950 GT 570M Extreme – a factory overclocked, passively cooled solution – along with NVIDIA’s reference card that came with the puny heatsink we’ve grown to hate ever since its introduction in March. 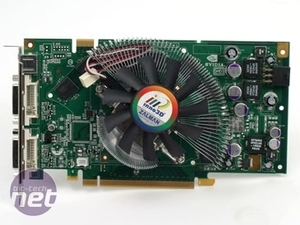 Thankfully, Inno3D’s GeForce 7950 GT doesn’t use NVIDIA’s reference cooler, instead going with the tried and tested Zalman cooler again – but we’ll come back to that later. 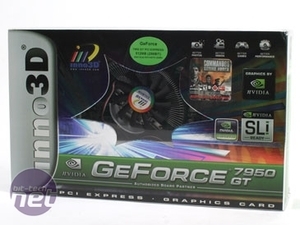 The box is as well-packed as the GeForce 7900 GS we looked at last month – the card is secured between some folded cardboard, and it didn’t seem to rattle around when we shook the box. The bundle shows some similarity to the one we got with our GeForce 7900 GS, but Inno3D has bundled a game with the card this time – Commandos: Strike Force. It’s an RTS game that doesn’t look too bad, but it’s playability will ultimately depend on whether you're a fan of the series or not. 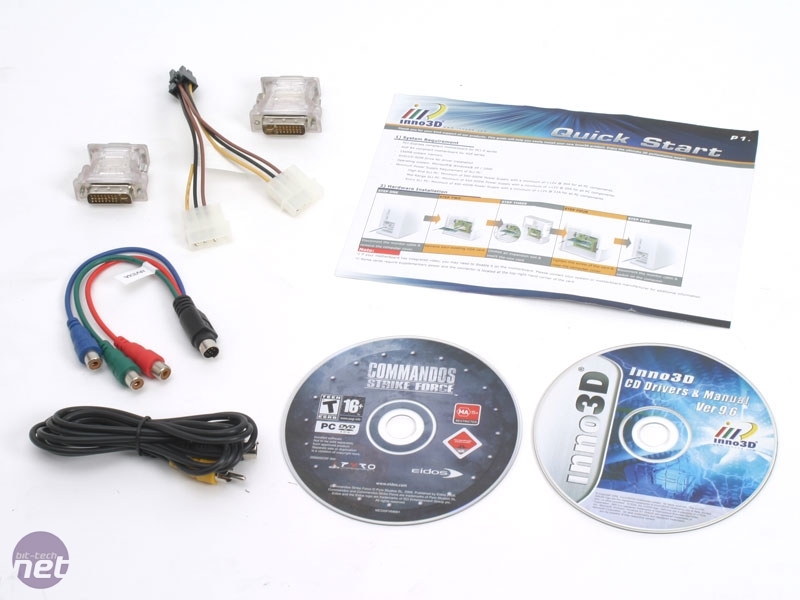 Along with the game, Inno3D has also included a pair of DVI-to-VGA converters – something that it didn’t do with its GeForce 7900 GS. The other cables included are S-Video, component out and a 6-pin PCI-Express power adapter. There’s also the standard utility CD and a quick start guide. Interestingly, though, there was no full-blown user manual this time around. 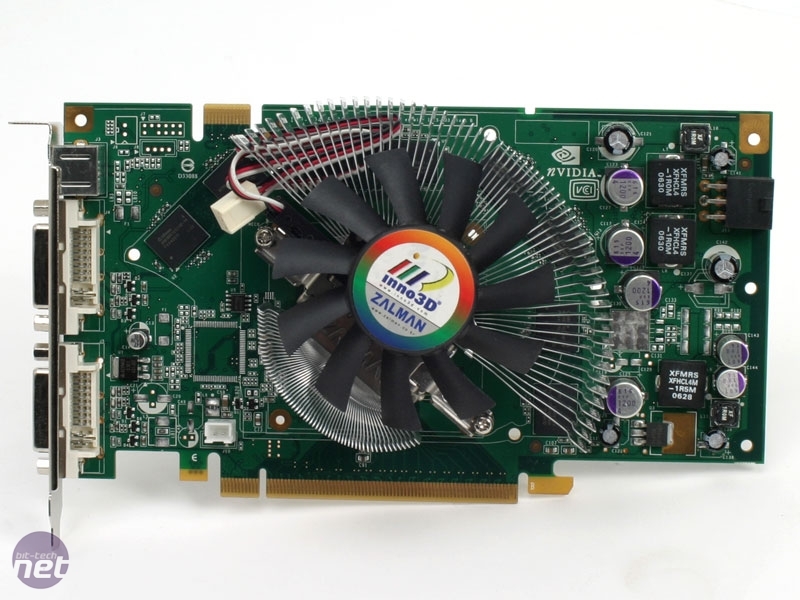 As we mentioned earlier, Inno3D has teamed up with Zalman, who provided the graphics card maker with a VF-700 made completely from aluminium. As you would expect from Zalman, it’s quiet and works incredibly well. The only downside is that it takes up two slots – however, that’s no different to NVIDIA’s GeForce 7900 GTX reference cooler; and since this card costs around £200, we don’t think it’s much of a problem. Inno3D has also opted to leave a standard 3-pin fan header on the card, meaning that you can plug it directly into your motherboard and monitor fan speeds from Windows using your hardware monitoring utility. Be sure to plug it in before you turn the system on though, because it won’t come as much of a surprise to you that the fan won’t spin up without that extra power. The eight 1.4ns Infineon memory chips on the card are not cooled and come clocked at NVIDIA’s reference speeds of 1400MHz (effective). The core is also clocked according to reference specifications – that's 550MHz, to those who don’t dream about video cards at night. Inno3D has chosen to differentiate via the cooler rather than by increasing the clock speeds...and so long as it remains competitively priced, we don’t see that as much of an issue – the better cooler should give you more mileage if you want to overclock. 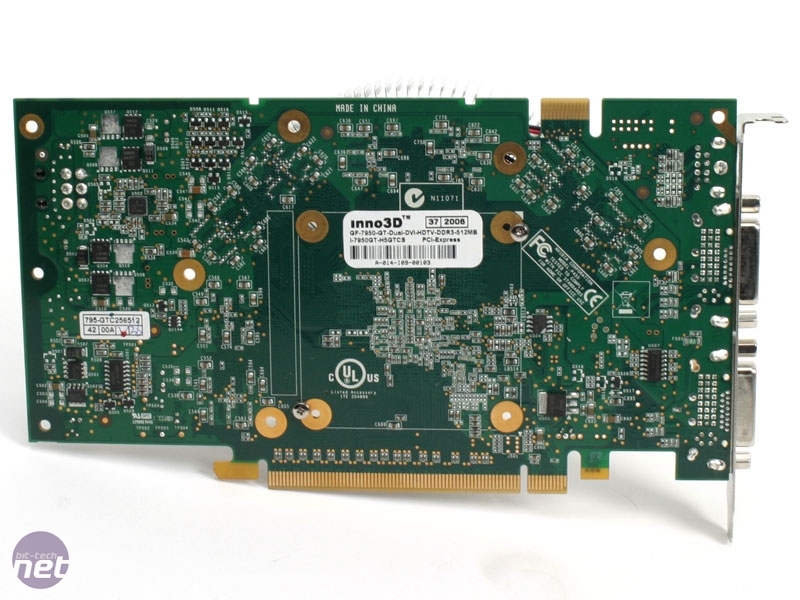 Again, much like the reference card, Inno3D includes a pair of dual-link DVI ports and an HDTV-out mini-din connector. 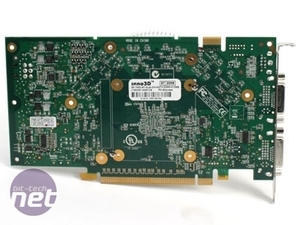 Since HDCP support is a requirement on GeForce 7950 GT, it comes as no surprise to find that Inno3D’s GeForce 7950 GT comes complete with the required HDCP crypto-ROM chip. 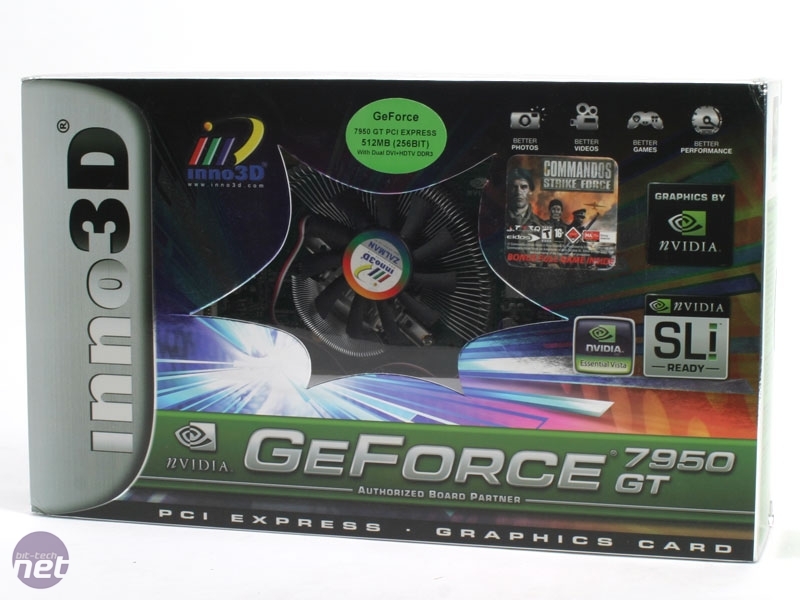 Warranty: Inno3D bundles its GeForce 7950 GT with a two-year parts and labour warranty, as per the minimum warranty requirements in the EU. If you have any issues with the card, just send it back. During the first year, you should contact your retailer, and after that you should communicate directly with Inno3D's support team. If for some reason you are unable to get hold of the place where you bought the card from, you should contact the board partner directly.